Babies can be unpredictable time bombs of happiness and irritation. He will display a whole lot of emotions at once and he won’t care about it as long as he is going to get your attention. Your natural response is to scoop him with your arms and soothe his woes. But another device would be able to do this if you’re a bit busy: baby swings. These contraptions will be able to cradle your baby for you if you’re a bit swamped with something for a while. This guide will be able to give you information about baby swings and its functions. 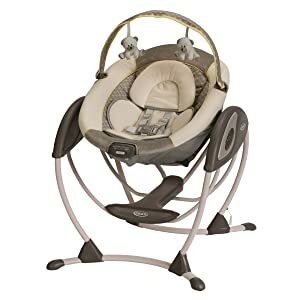 Cribs and strollers are one thing, but you will find this one essential if you want to cradle your baby and keep him entertained with just a small swinging bed. 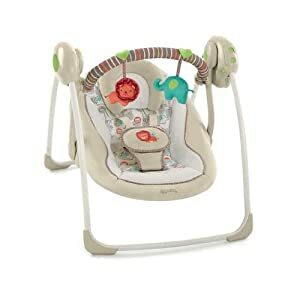 A baby swing is a sort of car seat for youngsters, but what differentiates this one is that it is supported by a stand. This device will keep your baby entertained and busy if it has some hanging toys. Babies are easily calmed when they are being carried or rocked gently. Baby swings are able to do such a thing very easily. Baby swings actually have 3 basic parts: a seat, which supports your baby; a motor that controls the motion; and a frame that holds the whole thing up from the ground. This one is a big contraption that you can easily consider as part of your house’s furniture. It has a wide bed and frame, so it will be a long time before your baby will finally outgrow it. The single motor on top of it can provide an adequate range when it comes to the swinging motion. It can be used from birth until about 8 months of your baby’s age. This one is smaller than its full-size counterpart. It is also lighter in weight because of its reduced size. Because it’s portable, two motors would be needed to be placed on its support frame. It also would need to utilize batteries because a cord will not be too helpful when you’re travelling. It’s much cheaper than the full-size baby swing. This one is a relatively new product that is meant to simulate a parent’s rocking motion when taking their babies to sleep. While the end points of the swinging arches are still a bit jolly, the motion itself is smooth, so it will be able to easily calm your baby and it may even help him fall asleep. Motion – The motion of the baby swing should be controlled and just right for the baby to actually tolerate the movement. It would be great if the swinging had a timer so that the baby won’t be subject to the movement for too long. Frame – This area is vital because it is the one that holds the cradle and the baby aloft. It should be durable, firm and steady. The best materials for the frame are those that are made of metal, but there are cheaper ones that are made of plastic. 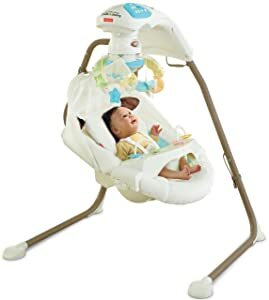 Add–ons – some additional hanging toys, a sound button or a set of colorful designs should round out your choice of baby swings. It will be great value for your money. This swing is a great looking contraption that also looks very secure. It has hanging plush animals and a removable tray for toys. The seat can be switched to face the side. It utilizes an AC adapter or batteries. 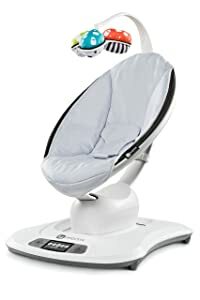 This one has a removable head support, a music box that has 6 melodies, adjustable swing speeds and an easy fold-up design that will allow you to transport it more easily. This one has a unique frame design; it has a lot of support beams, and a padded base that can act as a storage stand or a harness. The smoothly gliding seat can be set to a mild vibrating motion. Hanging toys are also included in this model. This contraption looks like it came from the future. The base definitely looks like a machine; it has a slew of buttons that will allow it to change the way the seat rocks. It can simulate a movement that can be likened to a moving vehicle, a running animal, a tree swing or a regular wave. You can connect this to a phone because it comes with an app that will turn your phone into a remote control. This one is a bit expensive, though. Baby swings are great for small children a day to eight months old, depending on the size and durability of your choice. They are helpful, especially if you want to do some work at home or if you’re handling some chores while watching the baby. It doesn’t replace the natural caring arms of a parent, but it can effectively simulate calm, soothing movements of a parent’s protective arms, if said parent wants to take a small break from carrying the baby.